Yves Saint Laurent, orange, wool, double breasted coat, having gold metal, fox head motif, embossed buttons. Coat has a pointed collar, with flap pockets . Back has a half belt with a center inverted kick pleat. Yves Saint Laurent, Rive Gauche, fuchsia, wool princess style coat, having a dropped waist and Mandarin Collar. Yves Saint Laurent, Rive Gauche, royal blue wool, jacket with black passementerie embellishment. No collar. Jackett falls at the hip. 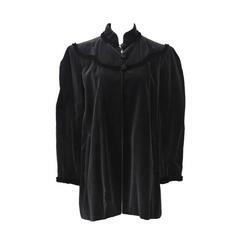 1980s YSL velvet mid-thigh jacket with black braid trim around Mandarin collar and yoke. Beautiful shade of charcoal gray.